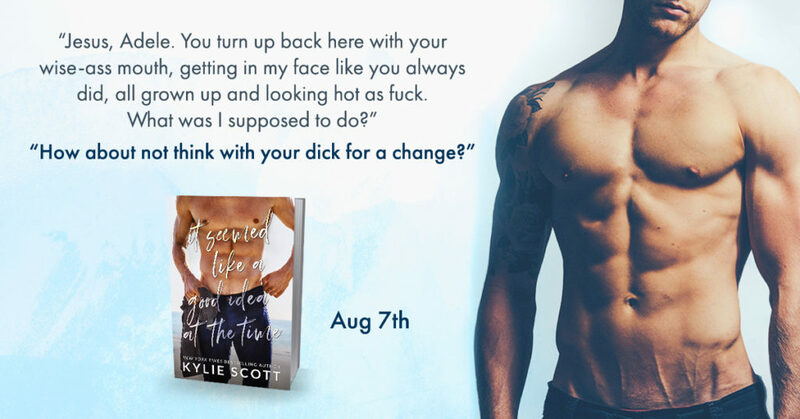 It’s been a while since I’ve read a Kylie Scott’s book and I enjoyed this story about two best friends who torn apart because one of them was in love with the other. After this conflict she ran away from her family and Pete’s life, just like that, trying to move on, leaving a mess in her wake. Here we go, years later, at her father’s wedding, coming back to that place, trying not to freak out all. But that’s another story! If you want angst, you’ll get it. Peter and Adele couldn’t having a proper conversation without some snarky remarks and going to each other’s throat. And they didn’t need to hide it, when one was pushing the other did it harder. Being in the same place, brought back painful memories but also great ones before everything get complicated. Even after so many years, Adele was still acting at times like a teenager. Especially around Pete. She might had a crush but even with all the strongest will, she couldn’t help herself. But she willing to be there for her father and not letting Pete into her life and being crushed again. She was trying to prove that she grew up and the girl she was before gone. She was spontaneous, taking things one day at the time, being this sense of balance in Pete’s life. Pete had to the mature one but he definitely wasn’t around Adele. These two could brought the best but also the bad to each other, without thinking about the consequences. As her father’s associate, things became more complicated for her. His broody side was pretty entertaining at first and I enjoyed his interactions with Adele. He seemed secretive, cold and emotionally unavailable. But only Adele had this ability to push his buttons like no one else. The foreplay was pretty interesting and entertaining. How these two former best friends would find a way to get back to each other without killing the other in the process? The road is going to be filled with many issues and also the scariest thing, to give their hearts and being vulnerable. I really enjoyed the first part and their childish behavior was kinda entertaining. If was waiting for the moment when things would change. I wanted a meaningful turn of events. Something that would turned me upside down. When this moment arrived I felt left out, it was good but I was expecting something more powerful due to their past. Overall, the chemistry was there, it had a great balance in the beginning and going through of the story but there was something off. I guess I built some high expectations around these two characters. It was enjoyable, hot and fun, pretty high on angst but not enough to me to appreciate the story at its fullest.